The Petoskey area is laden with opportunities for experiencing all a winter wonderland has to offer. If you haven't tried snowshoeing, a visit to the Inn is the perfect time to try. With several nature preserves, state parks, forest areas, and pathways nearby, the beauty of winter surrounds us. The age-old art of snowshoeing, once a necessity for navigating in deep snow drifts, is an ideal low-impact form of exercise, and a great way to experience the magic of a winter wonderland first-hand by giving you the ability to take the trails less travelled. The Inn and Cottages offer guests complimentary snowshoe rentals from the front desk, and if you're not prepared to venture far, the Little Traverse Wheelway is a beautiful tree-lined pathway with views of Little Traverse Bay, with a point of entrance right in the Village at Bay Harbor. Tubing isn't just for the water! Snow tubing is a fun, family-friendly winter activity that Boyne Mountain and Boyne Highlands offer on a groomed, closed course. Similar to sledding, with a little more padding, you get to sit back and enjoy the ride while the lift takes you up to the top of the hill. From there you can join together with your group, or fly solo as you race down the slope - either way, speeding in the snow on a tube is winter fun for all. Open to ages five and up. Whether you're an avid bicyclist missing your sport or you're simply ready for a unique experience, fat tire biking is a wonderful winter activity. Explore paths and trails that would normally be inaccessible on a bike during winter months, using a special bicycle with extra-large snow tires that glide easily over the snow and ice. 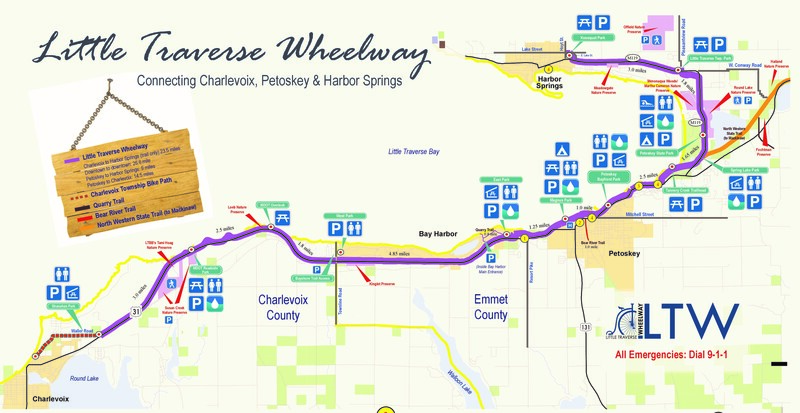 The Little Traverse Wheelway, spanning 23.5 miles from Charlevoix to Harbor Springs, is a popular path during the summer months, but the views and scenery in winter are just as stunning. Rentals are available from several local shops, as well as Boyne Mountain and Boyne Highlands, with both resorts offering their own 5km+ trails. There's something about ice skating that brings pure joy, and the magic is amplified in the winter! There are several locales to enjoy this old favorite for a romantic evening or family outing. Take in the fresh winter air and sparkling snow at an outdoor skating rink like the ones offered at the Petoskey Winter Sports Park, Avalanche Preserve in Boyne City, Harbor Springs Sk8 Park, Boyne Mountain, and Boyne Highlands. The warming houses at both Petoskey and Boyne City locations offer shelter and skate rentals. If an indoor skating experience is what you seek, the Petoskey Ice Arena is located just a short drive north from the Inn and offers open skating on Saturdays from 6:30-8pm. And last, but definitely not least, one of the most obvious of favorite winter sports for northern Michigan - skiing and snowboarding. The Inn is centrally located to sister resorts, Boyne Mountain and Boyne Highlands, and guests on Ski & Stay Packages have access to the most skiable acreage in Michigan. If you're not up for downhill thrills, cross-country skiing is another great option with trails available at both resorts, plus the flexibility to ski along trails in the several local state parks and nature preserves. How will you explore northern Michigan this winter?